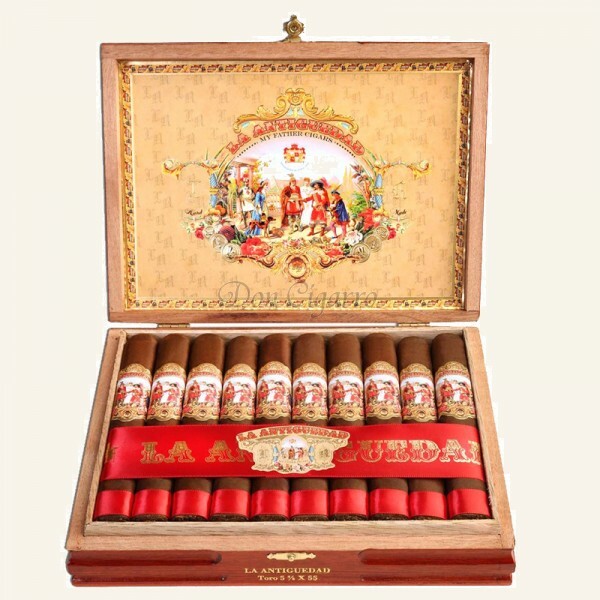 La Antiguedad (The Antiquity) is the Garcia's second project to be developed after the mega success of Flor de las Antillas, in which they will once again embrace the authenticity and historic value of the original Cuban art. Created by master blenders Jose "Pepin" Garcia and Jaime Garcia, La Antiguedad is a super-premium cigar handcrafted in Nicaragua, using the world's finest Cuban seed Nicaraguan grown tobacco. The filler tobacco for La Antiguedad is cultivated entirely in Nicaragua on the farms of San Rafael, Las Quebradas, and San Jose, all privately owned and operated properties of My Father Cigars. These tobaccos undergo a very strict and rigorous curing process of no less than three and a half years to guarantee exceptional quality. The Garcia family classifies the exquisite blend found in La Antiguedad as medium to full in strength, which offers complex yet balanced flavors.